The 2018 San Juan County Fair is fast approaching! Different people associate different things with the Fair. For some it is the carnival. For others it is 4-H events, and for even more it is seeing your friends who you haven’t seen since last year’s fair. For me it is the food. 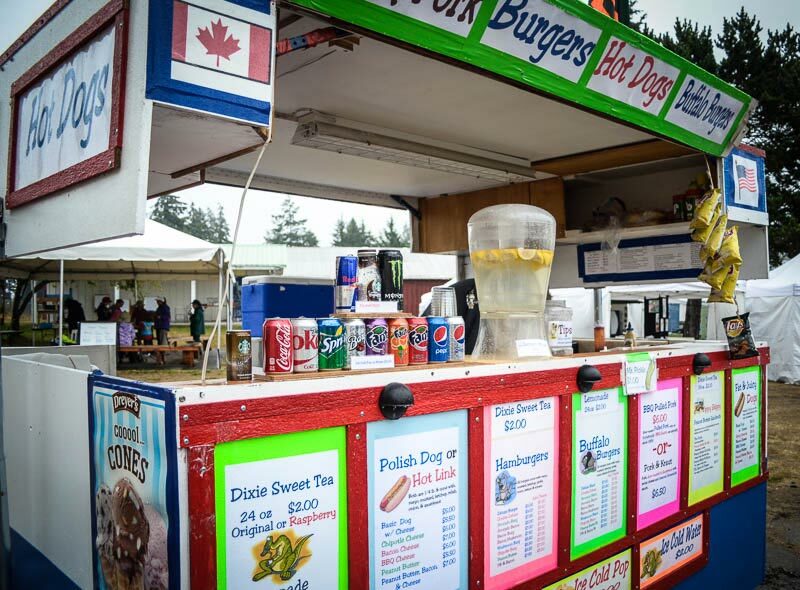 Once again this year, the food court will be a busy bustling place from start to finish. Here is insider tip #1: Although the Fair opens on Wednesday, if a food vendor gets set up on Tuesday they will always start selling early, once the Health inspection clears them. The County Health Department is on our team at the Fair, and have always made themselves available at a moment’s notice, and help keep us safe. So, on entry day when you enter your prize vegetable or pie or photograph, head directly to the food court for an early dining start. I always kick off the fair with a plate of curly fries. My friend John says that for him it is a corn dog. My friend JB says it’s the brisket. This year you will have a chance to eat fried catfish and collard greens, a plate of Pad Thai noodles, or a buttery cob of corn. If you’re a traditionalist, eat the American Legion burger or a 4-H Rambler breakfast. If you have a taste for the exotic, try a Philly cheesesteak sandwich, bison burger or Lebanese street food. New this year is Hawaiian style BBQ, Himalayan dumplings, salami sandwiches and empanadas. Vegetarians don’t despair! We have stuffed baked potatoes, sweet potato soft tacos, and veggie burgers. Whatever your meal, save room for a sno-cone, ice cream, crepes, kettle corn, Hungarian elephant ear or the infamous PTA pie booth. Yes, there is an espresso stand as well! Insider tip #2: The Fair Board has contests every day with the prizes being free sno-cones or ice cream. Wednesday (All day including lunch) Paideia Classical School will be selling Italian Porchetta (boneless pork roast) sandwiches. They sold out early last year. Friday (all day including lunch) the Lions Club will be serving kielbasa and slaw. Saturday night the Purple and Gold Club continues their tasty tradition of a steak and baked potato dinner. They sold out last year, as well. Each of these non-profits regularly raise $2,000-$5,000 from this event for scholarships. Come out and support our kids! Now, the important part. Did you notice Thursday evening was not mentioned? That’s right, for the past two years we have not had a BBQ dinner on Thursdays. Anybody interested? Contact the Fair office for more information. I’m thinking seafood, or pizza, or gyros, or salad. Okay, probably not the last one, but just use your imagination. Insider tip #3: Start eating early, and eat often to get the best bang for your buck. Also, walk around a lot to make room for more food. Brad Fincher is a Fair Board member since 2001. One of his greatest joys is eating something from every food booth each year.